Candidates for the forthcoming elections of Sri Lanka Cricket Mohan de Silva and Ravin Wickremaratne are planning to seek legal action after their nominations for the post of president and assistant secretary respectively were rejected by the Appeal Advisory Committee appointed by the Sports Minister. “We believe the judicial system in our country and we believe seeking justice from the court is the only way to prove ourselves from the allegations brought against us,” said Mohan De Silva at a press conference held at the CCC pavilion yesterday. ”I have not been officially informed by the respective committee of this new development. I have never been found at fault or accused of any wrong doings either in the field of cricket or outside it and hence I value the very reputation I have built through hard work. Besides I am someone who has fulfilled the stipulated requirements to be eligible to contest the presidency of Sri Lanka Cricket,” he said. The appeal committee’s decision is based on the 2005 dissolution of the then SLC administration Involving Mohan de Silva. As per the SLC constitution, and the country’s Sports Law and regulations, no person from a dissolving administration can contest for a cricket board election. 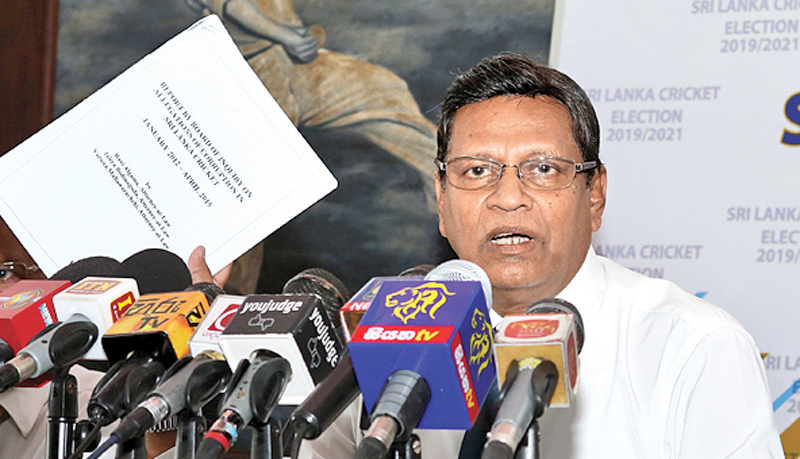 “In 2015 the then Sports Minister Navin Dissanayake appointed an Interim Committee and a three-member committee to investigate corruption at SLC when Jayantha Dharmadasa and Nishantha Ranatunga were holding office as president and secretary. The Ministry of Sports should treat everyone in the same way. This decision taken by the appeals committee seems a personnel attack on us,” said de Silva. “If we are found of any allegation they should investigate us and they need to send a charge sheet but nothing has been sent us officially yet. This is violating human rights,” he said. On February 6, the Chairman of the Appeal Advisory Committee Nimal Dissanayake (former Supreme Court judge), Devika Tennekoon (former Supreme Court of Appeal Judge) and the former Additional Director General of Customs Dharmasena Kahadawa handed over their report to Sports Minister Harin Fernando. The much awaited SLC election are scheduled for February 21.